Thank you for visiting our site! We are located in Southwestern Ontario, but we would be happy to travel to where ever your wedding is taking place. We look forward to being a part of your wedding day. Our repertoire is extensive from baroque to romantic, classical to celtic, light pop to hymns and traditional. The Soenen Sisters add a touch of sophistication and elegance to your event at competitive rates. 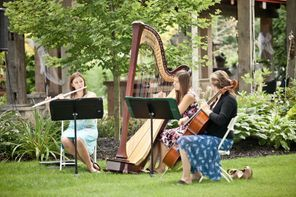 We are an experienced and versatile ensemble with years of experience performing for weddings, concerts, dinners, and more. We have recorded 4 CDs since 2003 and have won many awards over the years for musical excellence in a wide array musical styles and genres. If you are interested in having us play at your wedding or any other special event, or would like to book music lessons, please contact us by email or phone. You can find this information by clicking on the contact info button.